Have designers run out of ways to make the USB flash drive a desirable piece of peripheral for your computer? Well, apparently not. Remember those rendered cigars of Sarge in Quake III and the cut-scene in Star Craft? 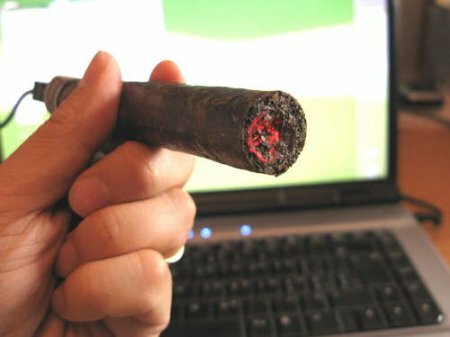 Well, here’s something that will definitely make your desktop much cooler sans smoke – the USB Cigar flash memory. It won’t harm your lungs one bit, and will actually glow red when connected, getting brighter whenever you access it. Woe to you if someone uninformed stumbles into the room when you’re not around only to panic and splash water on your computer for mistaking it for an actual, burning cigar that has been left unattended.